Freestylin' As part of Black History Month, Michael Eric Dyson, a Georgetown University professor, delivered the annual Martin Luther King Jr. Lecture in Kresge Auditorium on Tuesday, addressing forms of oppression. Some students had to watch the talk via lifestream after the room filled to capacity. 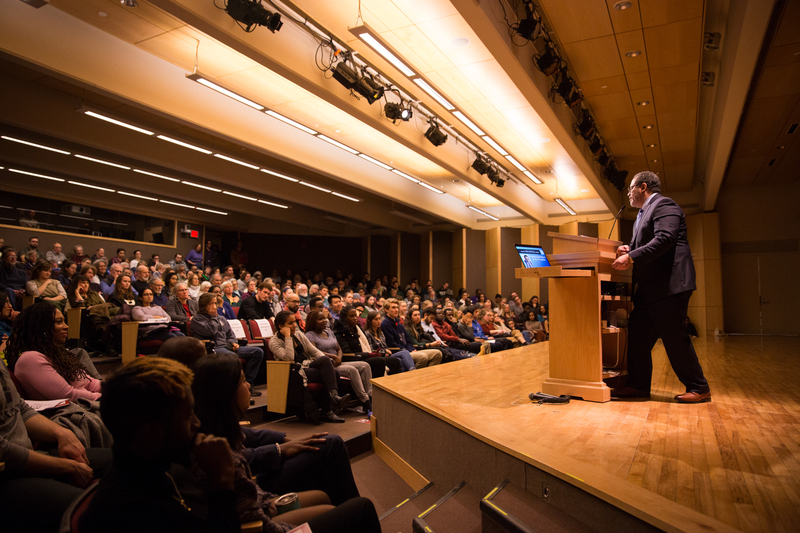 Prolific author and sociologist, Baptist minister, rap and pop culture connoisseur and dynamic storyteller, Dr. Michael Eric Dyson packed Kresge Auditorium on Tuesday to deliver the annual Dr. Martin Luther King Jr. Lecture. 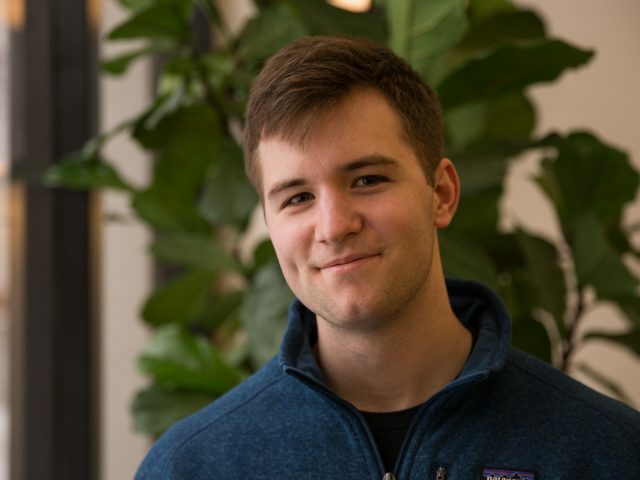 Dyson’s talk, titled “MLK for the 21st Century,” set out to imagine King’s vision in the context of contemporary issues such as police violence, sexism, homophobia and patriarchal power, sexual violence and the #MeToo movement. Dyson, who teaches at Georgetown University, centered his message around a quote from King’s final speech. “‘All I ask America, is be true to what you said on paper,’” Dyson said, quoting King. “If you said it, live it. Let America really be America. If you talk about independence, let everyone experience it. If you talk about justice, let everybody have it,” he added. Weaving in and out of a narrative detailing and quoting from the speech King gave the night before he was killed, the lecture addressed the work left to do to fulfill King’s vision. Eliminating racism, Dyson argued, was only the first step. 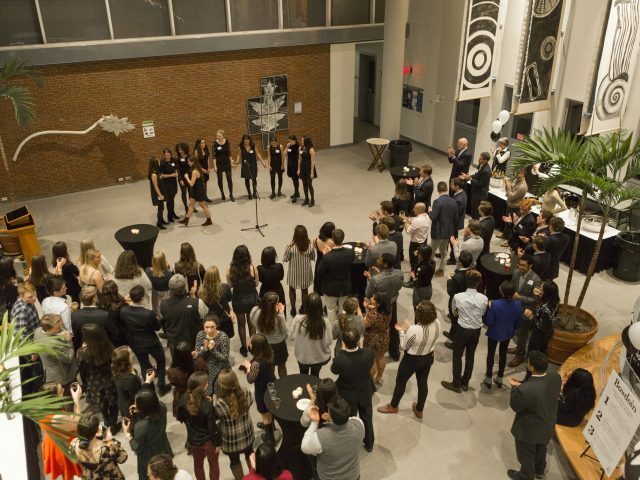 The event opened with a singing of “Lift Every Voice and Song,” led by Osa Fasehun ’18 and Alana Morrison ’20 and Dyson was introduced by Director of the Student Center for Multicultural Life Benjamin Harris, who knew Dyson previously. A testament to significant interest in the event, guests who couldn’t find seating in Kresge watched a livestream from elsewhere in the Visual Arts Center. At times delivered with a preacher’s bellowing intensity and at times conversational and irreverent, Dyson was full of sarcasm, with performative elements such as changes in cadence, tone and tenor. He illustrated his points with pop culture references, voice imitations and recitations of poetry and rap lyrics as well as numerous references to moments of historical amnesia such as the Christian religious motivations behind the 16th Street Baptist Church bombing in 1963. A central theme in Dyson’s speech was the power of whiteness; in particular, its ability to distort both conceptions of the self and collective understanding of American history. He laid out the importance of this endeavour early on with reference to NFL player Colin Kaepernick’s protest and a segment that transitioned seamlessly into spoken word poetry. While some liberals may have been surprised by President Trump’s ascendency, in Dyson’s eyes, he is the logical product of white hegemony. 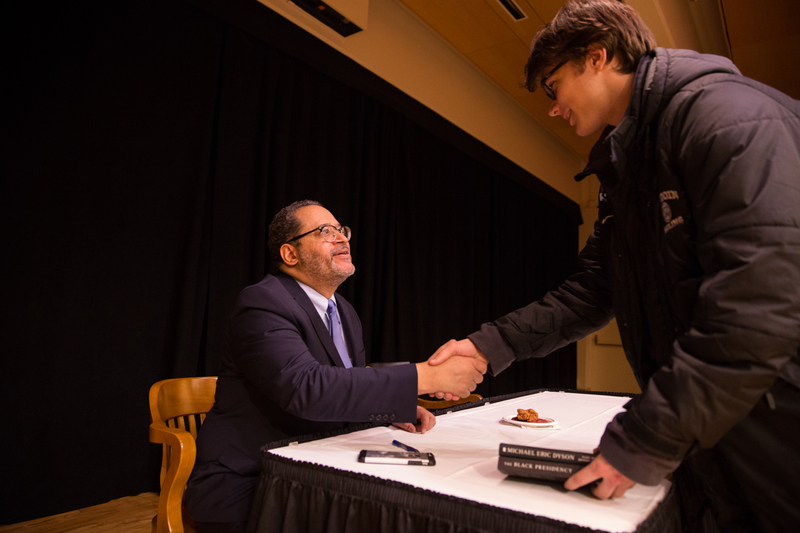 Meet and Greet Eric Hall '20 shakes hands with sociologist and author Michael Eric Dyson after his talk on Tuesday. Dyson addressed Martin Luther King, Jr. in the context of contemporary racial and gender oppression. And according to Dyson, Trump exploited his predecessor’s inability to engage in a conversation about race with white Americans by making xenophobia a centerpiece of his campaign and riding barely veiled racism to the presidency. As much as whiteness ran through the lecture, so too did lifting up women and challenging misogyny and homophobia. Dyson grappled with one of the biggest social shifts in the last two decades—the gay rights movement—and imagined King, who he acknowledged was a prototypical patriarch and likely homophobic, would have embraced this priority. “And then finally, if we are going to make America America for those who are locked out. How are we not going to talk about women in this moment?” he said. In a poignant anecdote about Thomas Jefferson’s sexual relationship and children with Sally Hemmings, Jefferson’s then 14-year-old slave, Dyson hit on the intersection between patriarchal and racial power. “#MeToo, got some ancient roots,” he said. He concluded with a powerful statement about the importance and power of women, drawing from Harriet Tubman. Jill Tian contributed to this report. 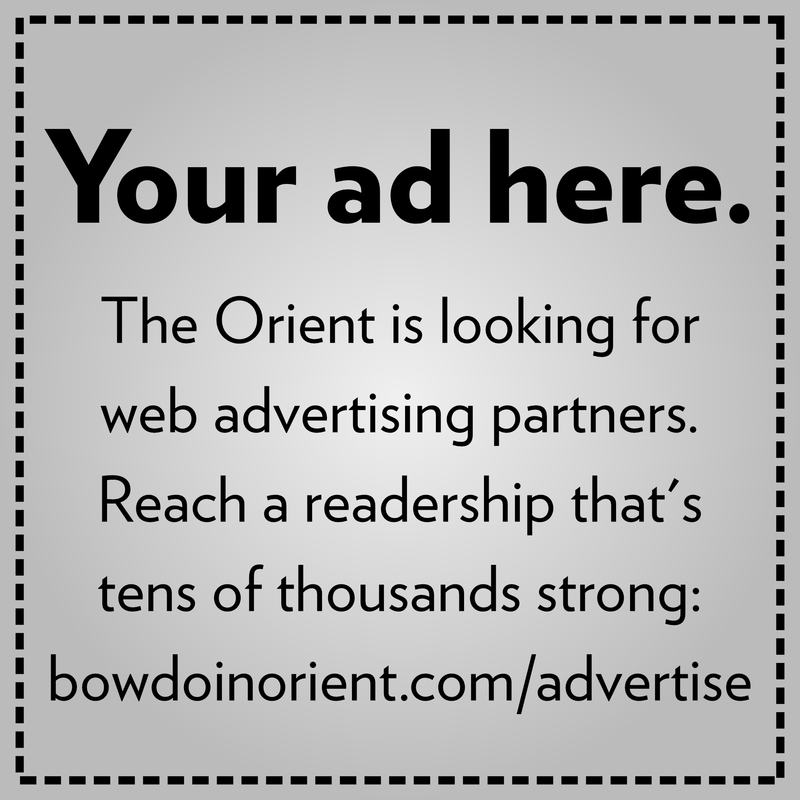 This spring, the Office of Academic Affairs will pilot alterations to the Bowdoin Course Questionnaires (BCQs) with a goal of reducing the role of unconscious student biases in course evaluations. The change was announced at last week’s faculty meeting. Since mid-December, more than 60 students’ email accounts have been hacked, resulting in a series of phishing attempts. Emails claiming association with Temple University and such fictional institutions as “Recruitment Team,” “Market Force Information” and “Mystery Shoppers” arrived in inboxes with promises of easy pay—provided that recipients enter sensitive personal information first.